Openers STEEL PANTHER hit the Peterson Events Center stage precisely at 7:00 p.m. and ended right on time 50 minutes later (the digital counter that my buddy pointed outwas clearly visible from our seats); the JUDAS PRIEST camp seems to run a tight ship. I'm sure that most KNAC.COM readers are familiar with STEEL PANTHER, so suffice it to say they performed a tight set of their 80s-style hard rock and metal paired with raunchy satirical lyrics. While they couldn't do their full show (and probably had to keep it a bit more G-rated due to the venue/barriers/security [and possibly at the request of JUDAS PRIEST]), they got in plenty of standup along with the music. Speaking of, all of the members are excellent players and they write catchy songs in this style - which I think is their greatest strength. Otherwise, the act wouldn't have enough staying power. Accordingly, it's no suprise that none of these guys are newcomers to the scene; most notably, guitarist Russ Parish played with FIGHT (word is that Halford helped them get the tour) and vocalist Michael Starr (previously kicked around in LA GUNS). STEEL PANTHER is very entertaining live - this evening was no exception - but I am disappointed by their use of backing tracks; they're good enough that they don't need to go down this road. Any diehard metal fan will tell you that at this point, it's difficult to pass up a JUDAS PRIEST show; particularly in light of their previous farewell tour. That said, realistically, how much longer can they continue? Maybe another five years? Time will tell, but it is great to see them still out on the road and performing at a high level. It's rather sad to think that when JUDAS PRIEST, SCORPIONS, MOTORHEAD - and a host of other classic acts - finally call it quits, no younger bands havereached the point where they could pick up the mantle (without getting into the gory details, the state of the industry makes this nearly impossible). Suffice it to say that metal fans are witnessing the end of an era. With that, my mindset when attending this show was that it's fantastic that JUDAS PRIEST is still around, and the rest of the roughly 5,000 fans in attendance (disapointing for a band of their stature on a Saturday night, but it was still a respectable turnout) seemed to agree. The set list was not a typical greatest hits package, but I liked the fact that they mixed things up with deeper cuts and several songs from this year's release, Redeemer Of Souls - which, of course, is what this tour is all about. Redeemer Of Souls seems to have rejuvenated the band and is connecting with most fans better than their previous CD, Nostradamus (2008). The choice of material suited Rob Halford's range well and may have been a factor in selecting the material. The end result was that he sounded strong and confident; sure, he can't quite hit the "Painkiller" highs that made him famous, but even so, he's not called "The Metal God" for nothing. There were some moments when I said to myself, "This is what a pro metal vocalist - and one of the guys that wrote the book" - sounds like. Rob also had a good rapport with the audience, and spoke like an English gentleman between songs about the history of JUDAS PRIEST, their appreciation for the fans, and how happy they were to still be making metal together after all this time. Classy and positive without being overly sentimental or diminishing the pace of the concert or the power of the music. 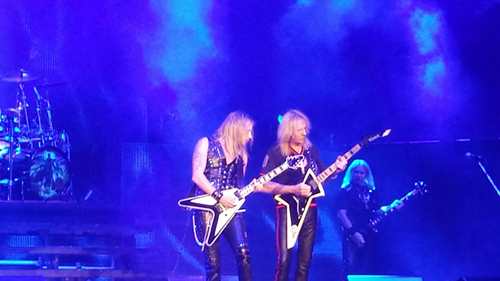 Richie Faulkner and Glenn Tipton were both sharp, but I was surprised to see that Glenn essentially let Richie have center stage in terms of the guitar work. Of course, Glenn took his composed leads and they deftly pulled off the harmonies, but the rest was all Richie. His solo spot in the middle of "You've Got Another Thing Comin'" was flashy and speedy without being overbearing; I just wish he would backed off the wah and chorus a bit, as I thought it muddied up his sound. To his credit, he seems to have settled into the role quite comfortably, and is showing what he has to offer as an individual player respectfully in the context of JUDAS PRIEST. 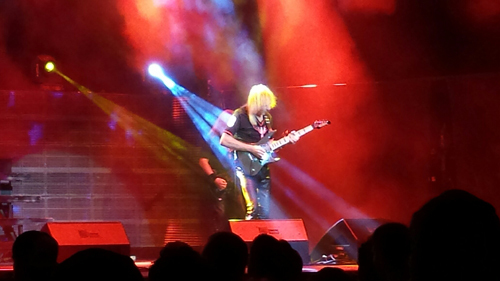 Ian Hill didn't move from his designated spot at stage left (behind Tipton), but he nontheless went through his repertoire of metal bass moves and laid down the thunder throughout the evening. 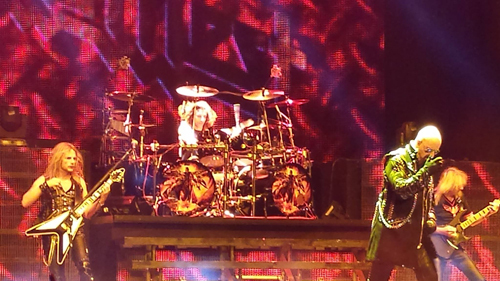 Scott Travis, as usual, was a machine - and made it look easy. Three words: elite metal drummer. The stage set wasn't elaborate, but was ample, modern and sleek; video screens incorporated stage left/right and as a backgroup provided album cover graphics and imagery to accompany each song. Lighting and sound production were exactly what I expected; totally professional. The volume was actually at a fairly comfortable level for a venue of this size, although they did pump it up a bit too much towards the end of the show. But such is metal tradition ... Speaking of, the Harley made the expected appearance for the set-closing "Hell Bent For Leather." Rob performed the whole song sitting on the bike, and I imagine it was a welcome break for him. With his documented back problems, there was no need for him to take a chance being distracted while trying to park the darn thing! It's telling when a band can play nearly 20 songs - and arguably omit some of their greatest hits - and still not have a bad one in the bunch. 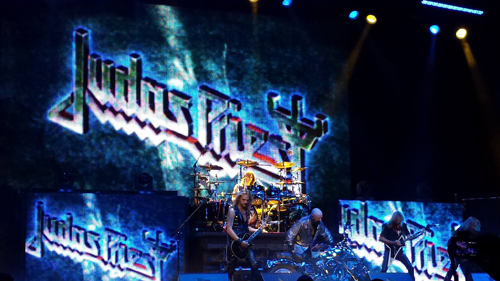 JUDAS PRIEST can still "deliver the goods" 40 years in, and it was a thoroughly enjoyable evening of metal - and yes, a bit of nostalgia. At this stage, we're all "defenders of the faith," so be sure to catch a date on this tour and show your support for a legendary band and one of the genre's forefathers.